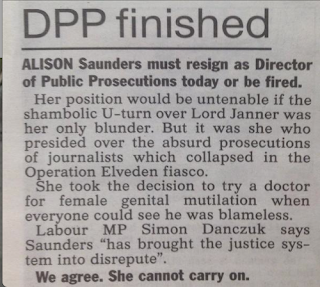 The case of former MP Greville Janner, who has been the subject of allegations of misconduct towards under-age males for many years, has been the source of much righteous outrage by the press, after DPP Alison Saunders first decided that putting him on trial would not be in the public interest, due to his advanced dementia, only for the decision to be reversed, prompting some papers to call for her resignation. That's what I bladdy think of youse bladdy due bladdy process, ya bladdy Pommie drongoes! Some titles, like the Mail, simply come over all sniffy and condescending, while the Murdoch empire has let slip the real reason they are sniffing blood. Ms Saunders took the decision to prosecute all those journalists who have been subjected to trials as a result of what the Met has called Operation Elveden. All those journalists worked for the Sun. The iron code of the Grubstreet Mafioso dictates there must be vengeance. 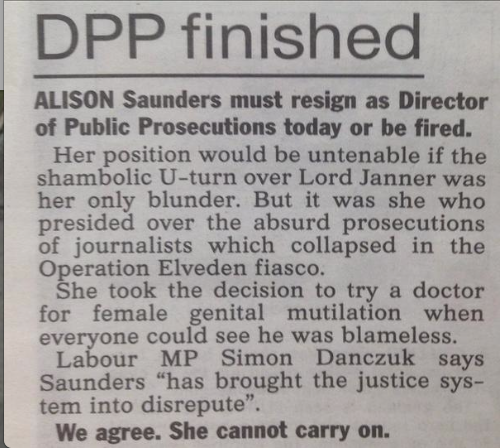 At least the Sun and Times are honest about their motivation, with the former particularly unsubtle: “ALISON Saunders must resign as Director of Public Prosecutions today or be fired … Her position would be untenable if the shambolic U-turn over Lord Janner was her only blunder. But it was she who presided over the absurd prosecutions of journalists which collapsed in the Operation Elveden fiasco”. 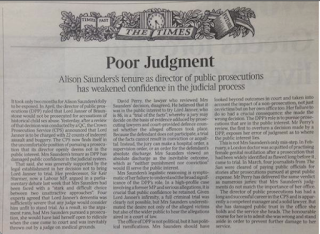 The Times takes a more aloof but similar line, with an editorial headed “Poor judgment”, which goes on to claim “Alison Saunders’s tenure as director of public prosecutions has weakened confidence in the judicial process”, managing not to see that “the judicial process” is what comes after the decision to charge. But then, the Times is not only no longer a paper of record, its journalism has also long ago gone down the chute. That Times editorial comes, to no surprise, to the same conclusion as the Sun: “The honourable course for her is to admit she was wrong and stand aside in order to prevent further damage to her service”. The trials cited - the Sun journalists, and a doctor accused, but later cleared, of practising female genital mutilation - are the same. The only difference is that the Times drives it around the houses before drawing its conclusion. 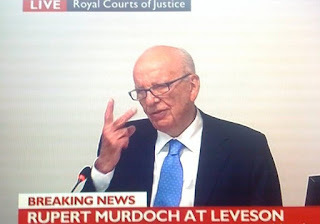 Perhaps the Murdoch titles really care about the victims of possible past abuse by Janner? Maybe there is a desire to see justice prevail? This is a possibility. But the first reaction of such organisations when they perceive themselves to be under attack is to defend themselves, if necessary by lashing out and attacking those they think are to blame for their plight - so long as they don’t blame themselves. And blaming themselves would be the most appropriate course: after all, it was News International’s Management and Standards Committee that shopped all those journalists in the belief it would stave off corporate charges. And those trials did not merely collapse: many public servants were jailed for selling information to the Sun. No, for Janner’s alleged victims they shed only crocodile tears. 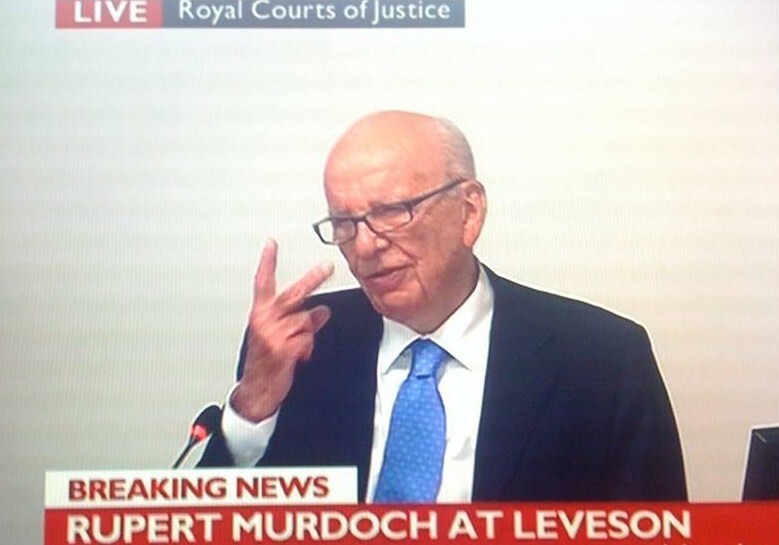 The Murdoch press cares only for itself. This is just vindictive score-settling. Thankfully, thus far, it appears to have failed. I must say I greatly enjoy the spectacle of the neocon and Murdoch gang frothing at the mouth. Only one thing could be better, and that is the prospect of them meeting up with Sweet Pants in the communal shower at the Scrubs. The latest comedy script was one of Murdoch's cockney fascists bleating on the pavement about "A wyste of pablic manny" with Kavanagh as puppeteer in the background. I haven't laffed so much since Bryant told Yankified Just Jimmy Murdoch that he was a mafioso, and so was his creepy da. Bring it on, I say, bring it on. Every time they rant on they sound more and more like Volkischer Beobachter or Der Sturmer. Which, come to think of it, in the case of the Daily Mail is entirely appropriate. This could blow up in their faces very quickly and easily. The original decision not to take it to court was based on a medical opinion, basically CPS felt the trial would never go ahead because the defence would argue medical conditions and the judge would agree. So what happens now is that it will go to court. And the defence WILL argue medical conditions. So what happens if the judge agrees and ends the trial before it begins? Saunders will be vindicated and at great expense to the public. Will the papers be ready to acknowledge that she originally called it correctly?